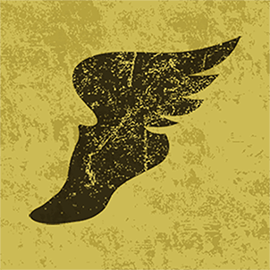 50-Mile bibs are red, 50K are blue. Remember what day it is too. I noticed something interesting while going through Brian McCurdy’s fabulously FOMO-inducing photo galleries from this year’s Squamish 50 looking for images to use for the background of this year’s Thank You plaques. Colin Miller, the only three-time finisher of the Squamish 50/50, appears to have coordinated the colours of his race outfits to match the bib of each day’s leg of the 50/50. 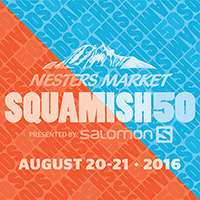 The Squamish 50 hosts a 50-mile race on the Saturday of race weekend each year and a 50k on Sunday. Since 2014, racers have had the option of running both by registering for the 50/50. To differentiate between races, I designed red bibs for the 50-mile, blue bibs for the 50k and a bib that’s half red and half blue for the 50/50. 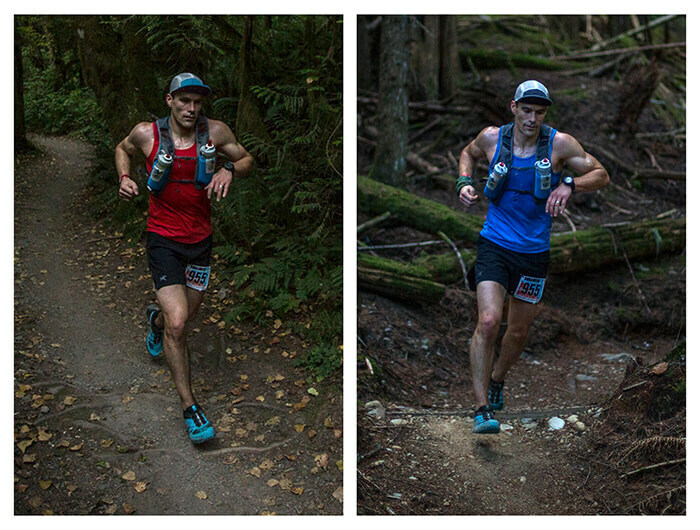 Photos of Colin show the defending 2015 50/50 champion wearing red during the 50-miler and blue for the 50k. Intentional or not, I take my hat off to you Colin! Well run and well played. Colin was runner-up in the 50/50 this year, just over 20 minutes behind Chris DeNucci, and was third overall in the 50-miler and seventh in the 50k (The Denuch was second and fourth, respectively). Colin was also runner-up to Michael Wardian in the inaugural Squamish 50/50 in 2014. No, no, this is a different 50/50.